Ed Jensen, from Tk’emlups te Secwepemc, grew up in a big family and spent much of his time as a young boy playing with things he made himself. He started bow-making in his backyard, progressively evolving his creations, making them more sophisticated with materials that were traditionally used by the Secwepemc, located in the interior of BC. As Ed grew up, he started doing research on flint knapping and spent much of his time in the museum. Ed credits Secwepemc ancestors for teaching him and inspiring him through their work. Ed would examine their work to understand their techniques and then would go home and work at replicating what he saw, returning to the museum if he was unable to recreate what he had seen. Today, Ed is a well-known Secwepemc weapons specialist. Ed believes stone tool technology had a wide-reaching effect on the Secwepemc economy, largely due to glassy basalt – a high grade volcanic material unique to the territory and an important part of how the Secwepemc were able to manage a larger territory and maintain their borders. “Our technology advanced a little quicker than many other nations who didn’t have basalt. 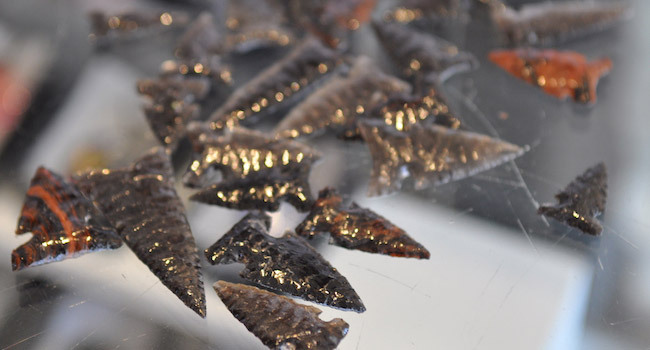 As a modern-day flint knapper, I know that basalt, being harder, is more of a challenge to knap finished points than obsidian, which is like glass and is fairly easy to work with. Using bone tools, however, 500 years ago or 5,000 years ago, would have made working this material considerably harder to do, so the ancestors compensated for that with perfect technique. Technique in stone tool technology is very important, so the masters of the day became just that, masters. Our ancestors’ superior workmanship was prevalent and the craftsmanship is evident in the museum. Those masters would have created these pieces and traded for things they needed in everyday life. I think if we look at our civilization in a common-sense way, today we have plumbers, doctors and all of these professions, I think it existed pre-contact as well. Not only that, the materials moved in and out of the territory as well. If you look in the archaeological record, you’ll see basalt all over the place and you’ll see one or two pieces of obsidian. The reason is obsidian is nice, it’s pretty and it creates a sharp edge but it’s a one-use product. As soon as you use this, it’s going to break. Glassy basalt is a lot more durable, it gets just as sharp, and has a little more density so it creates a better tool. You’ll typically see a lot more of it outside our boundaries than inside, so the trade would have been an export. Technology spread through neighbouring nations and evolved through the ages. We went from rock throwing to the hand-held atlatl (spear thrower), to bows, and when the bow hit the territories, it changed everything. From that point, they worked on fine tuning technology to create bows that would be faster, stronger, more compact. Our ancestors were lucky to have all the right materials in our territory. As a result, our tools and what we could create with them were superior. Clearing the Path thanks Ed for sharing his knowledge of the pre-contact Secwepemc trade economy. If readers are aware of pre-contact markets and economies in their nation and would like to see these stories featured in Clearing the Path, please contact us at communications@fntc.ca or 250.828.9857.